About a year ago I learned of an organization that provides quilts to kids with cancer, Quilts for Kids. I was very pregnant with baby relish at the time and promised myself I would get around to making a special quilt after baby arrived. It might have taken me over a year but I finally have one to send off. You can request a quilt kit to be sent to you if you are not able to use your own fabrics and there are several quilt patterns on their website that you can download. I decided to use the fabrics from my own stash. I actually was able to use all the leftovers from my "Oh, the Places You'll Go" quilt. I had about 1/8 of a yard left of each of the prints used and that was more than plenty to make the 6x6 inch square center. I just used fabrics from my collection for the border and then used a soft flannel for the back. 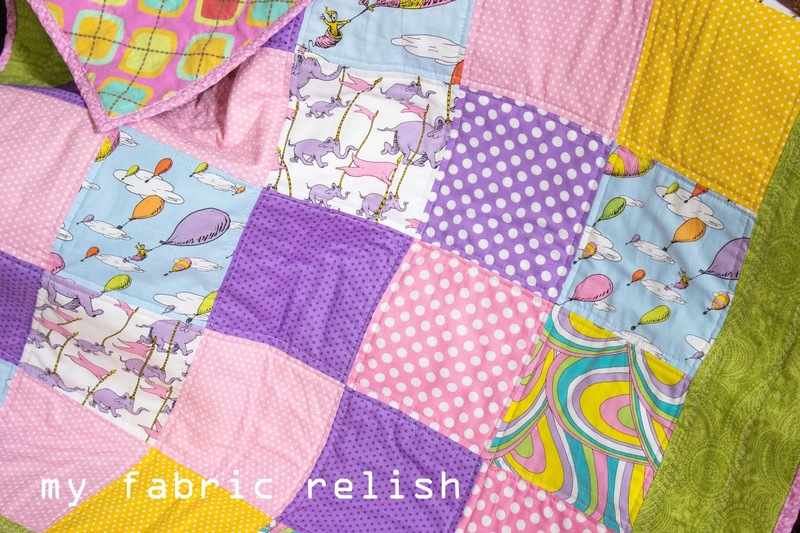 This quilt took two short afternoons (that's with taking care of two kiddos, too). 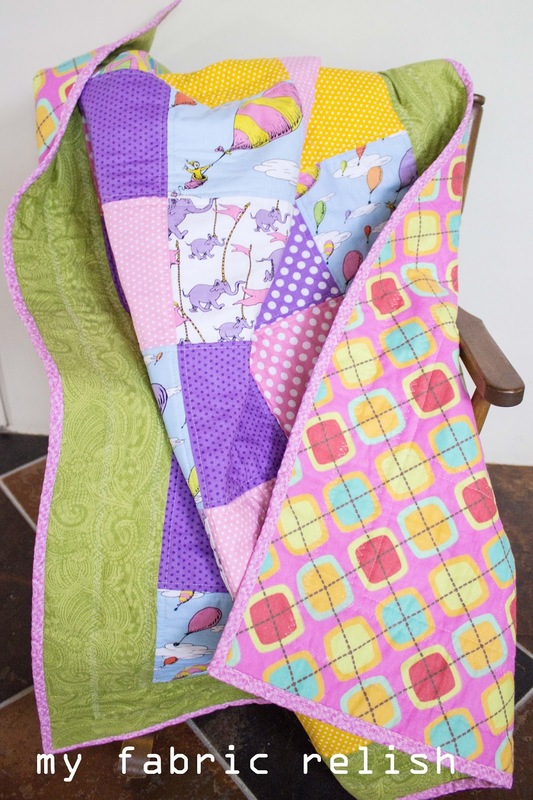 If you are in the mood to whip up a small little quilt and you have scraps or leftovers that you just don't know what to do with, then make a quilt to give to a child who may need it. That turned out beautifully! Only 2 afternoons? With kids?? That's pretty awesome! What a pretty quilt. Thank you so much for linking up. Love this! I am working on a 100 Quilts for Kids project myself. 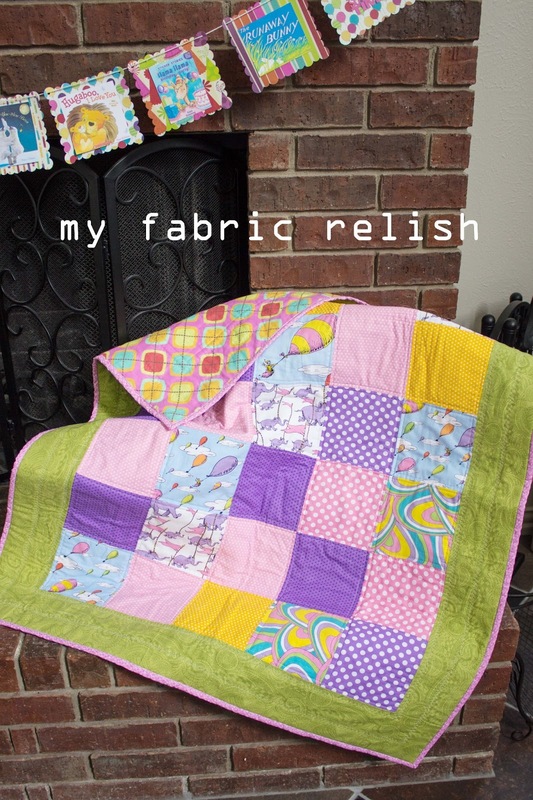 Saw your blog on Swim!Bike!Quilt and am now following you with bloglovin'. Love being able to use leftovers from one quilt for another project. Such a happy quilt--thanks for linking up to 100 Quilts, too.